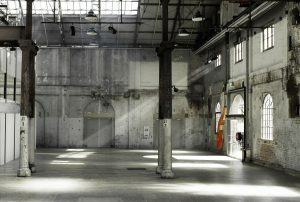 At the launch of the Embassy of Disappearance at Carriageworks, Mike Parr performed an action in the carpark outside titled Burning Down the House as part of the Biennale of Sydney ‪2016. In this work the artists own prints valued at $750,000 are ignited. Mike Parr is widely regarded as one of Australia’s most innovative and influential artists, with a career now spanning more than four decades. While his work varies in approach and encompasses a diverse array of media – performance, video, sculpture, installation, drawing and printmaking – autobiographical embodiment is a foundational concept to which the artist continually returns. In his performance work, Parr is known for testing the limits of his physical and mental endurance, variously cutting, branding, stitching, burning and nailing his body. While his works on paper appear less extreme at first glance, Parr always invites viewers to identify with his actions, using his body and self as subjects to investigate themes such as memory, identity and psychology.